Just Dance 2016 had revealed more information during the Gamescom games fair, held in Germany 5-8 in August. 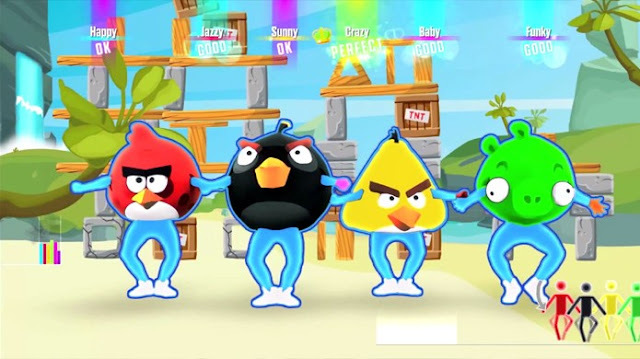 Among the new features are a unique way for the new generation and new songs as the theme of Angry Birds. Just Dance 2016 will be released on October 22 for PlayStation 4, Xbox One , Nintendo Wii U, PlayStation 3, Xbox 360 and Nintendo Wii . The extra mode called Showtime, allows the player to save the video clip, and has the possibility of creating an original choreography created by the user. Although the smartphone enough to play with the other terms in Showtime is necessary to use the PlayStation Camera on PlayStation 4, and Kinect on Xbox One gamepad or joystick on the Wii U. Among the new confirmed songs are a remix of the theme song of Angry Birds. Also, includes tracks "Balkan Blast Remix," "I'm An Albatraoz" of AronChupa, "Fun" Pitbull with Chris Brown, "Circus" Britney Spears, "Stuck On A Feeling" Prince Royce " Lights "Ellie Goulding," Boys (Summertime Love) "from The Lemon Cubes," Rabiosa "Shakira with El Cata and" Fancy "Iggy Azalea with Charli XCX.